Today we interviewed Hiromu Onishi (Chairperson of Hiroshima-Kenjin Kai) from Brazil, who studied at Hiroshima University as part of the Hiroshima Prefecture-Sponsored International Student Program. We asked him about the memories of his college days. Hiromu Onishi, second generation Japanese-Brazilian, was born in an inland area in the State of São Paulo. Amongst the turmoil of the Japanese immigrant community after World War II, his family moved to the city of São Paulo. Later, he became an international student in Hiroshima, the home region of his mother. After his return to Brazil, he put into practice his knowledge, which he had obtained during studying abroad, and started to work at a local Japanese enterprise in Brazil. After retirement, he became Chairperson of Hiroshima-Kenjin Kai and has made great efforts to propel exchange between Brazil and Hiroshima. 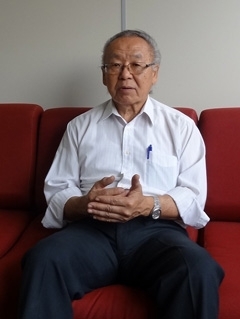 We wanted to know how Japan and Hiroshima looked to Mr. Onishi, studying as a second generation Japanese-Brazilian and what influence foreign study had on his later life. － First, please tell me shortly about your career before coming to study in Japan and about your background as a Japanese-Brazilian. I am a second generation Japanese Brazilian. My father came to Brazil at the age of 15, and my mother at the age of 16. They had an arranged marriage in Brazil, and lived in a very remote area. My father came from Hokkaido, my mother from Itsukaichi, Hiroshima. － Was it a settlement in the state of São Paulo ? (*) The struggle between kachigumi and makegumi : After World War II, the Japanese Brazilian community was divided into two parties. One supported the theory that “Japan won the war”, (kachigumi), and the other believed that “Japan lost the war”, (makegumi). For the Japanese who received prewar education, it was hard to believe that Japan had lost the war. These people formed the majority, and especially in the remote areas many people refused to accept Japan’s surrender and conducted terror attacks against the makegumi, of which there were a great number of casualties. － What kind of struggle was it ? My family did business. My older brother was a farmer and my father engaged in business in town. Business in a country town was like this: when the farmers went to town for shopping, they came to our shop for depositing things or receiving mail. Therefore, we had to do business with supporters of both, the kachigumi and the makegumi. Business is business, but it was easier to show favoritism toward the kachigumi, because they were terrifying. In our region about 15 or 16 people were killed by them. Actually, a researcher in Brazil wrote a book on this topic and in this book, there was a photo taken by my father. During the struggle, the police did several investigations and my father had been taken away by the police several times. Once he was even under arrest for 2 months. － Why did he become arrested ? (*) At the time, Brazil was under President Vargas who pursued a policy of nationalism. Japanese newspapers were forced to cease their publication, Japanese schools were closed and it was forbidden to speak Japanese in public places. As many Japanese-Brazilians couldn’t speak Portuguese and were treated as enemies during war, it became completely impossible in rural areas to receive proper information about postwar situation. Problems like this forced my family to move to Mooca*, a small city district of São Paulo, completely devoid of Japanese residents. I was the only Japanese-Brazilian at my school. That was in 1952. I didn’t use Japanese, only at home. From then, we lived in São Paulo City. For a short time, I went to a Japanese language school, but I was very busy. As I went only to Brazilian schools, I never used Japanese and I didn’t study it. (*) Mooca: District in the City of São Paulo consisting mostly of Italian immigrants. － What did you do thereafter ? hen I was 18 years old my father died suddenly in an accident. In a family of six siblings, it was necessary for me to postpone my accounting studies for a while to look after them. And one year later my friends and colleagues persuaded me to continue studying, so I went on to law school. In the past, elementary schools in São Paulo had an examination system. Those who wanted to go to a private school had to take an exam, although the level was not very high. Nevertheless, parents had to pay school fees. Good students tried to enter the charge-free state schools for the sake of their parents. I also went to a state school, but I wished to study accounting, which was only offered at private schools. My father refused to pay the school fees, so I applied for subsidies. But soon after that my father died in an accident, and I had to take over the family business. － What kind of business ? My father was an optician and ran a photo shop on the side. Brazil was very much behind in photographic technology. It took 3-4 days to develop colored films in the photo shop. Back then, there were only 2 processing stations in all of São Paulo and people even came from the countryside with their films. When I was a 3rd year law student, I was required to go for training. Law schools in Brazil take 5 years to complete, requiring a combination of concept learning from textbooks and practical skills as a trainee. There was a lawyer named Satoshi Murakami, who worked as a consulting lawyer of the Cotia Agricultural Cooperative*. He was also the chairperson of Hiroshima-Kenjin Kai. He was born in Hiroshima and graduated from a Brazilian law school. I worked part-time at his law firm as a trainee. *Cotia Agricultural Cooperative was established by Japanese-Brazilians in 1927. It grew into the biggest agricultural cooperative in South America, but collapsed under heavy debts in 1994. During my training period, Hiroshima-Kenjin Kai* was developing plans to build a new main office. Amongst all the buildings of several Japanese immigrant associations, the Hiroshima-Kenjin Kai was the oldest. The association stipulated articles and became registered in order to receive financial support from the Japanese Government. I helped write the required articles, and I learned a lot about the association and started to support its activities. (*) Hiroshima-Kenjin Kai (Brazil Office): Immigrants from Hiroshima, who after war had heard about the devastation caused by the atomic bomb, established the “Relief Group for A-Bomb Orphans” in 1950 and started to raise money. In 1955, core members formed the “Brazil Geibi Kyokai”. In 1959, the organization changed to its present name. When I was 22 or 23 years old, I heard about the scholarship sponsored by Hiroshima Prefecture. Graduation was still 2-3 years ahead, and it was recommended to me that I learn Japanese; I started studying mostly at night. － How was your Japanese before that ? I couldn’t speak any Japanese. My Japanese language teacher brought prewar Japanese textbooks (12 volumes altogether) and I used that for studying. It took me two years to reach volume 10. I guess I knew about 300 Kanji (Chinese characters). The teacher was very strict. For conversation, the teacher developed a system for Brazilians with 4-5 students. Those who didn’t study were told to stay at home. This is the first building of the Hiroshima-Kenjin Kai main office. It was completed in 1971 and embellished the title page of the Hiroshima-Kenjin Kai newsletter “Geibi” in December 30, 1972. The new building of Hiroshima-Kenjin Kai main office (Hiroshima Bunka Center) completed in 2003. 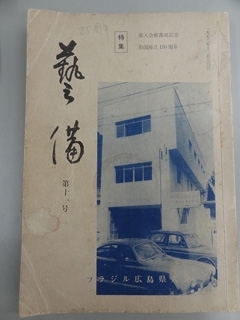 The photo on the left side shows the title page of the jubilee edition on the occasion of the completion of the building and the 95th anniversary of immigration from Hiroshima to Brazil. The ground-floor area is 1,440 square meters and is five-stories high including a basement. It is equipped with lecture and meeting rooms, an A-bomb panel corner, accommodation facility and a gym. 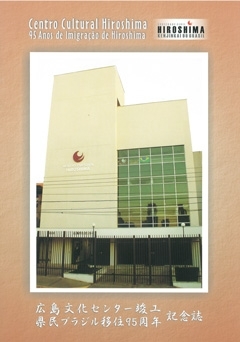 In 2009, the office of the “Hiroshima University Brazil Center” was set up within this building. When I took the examination for the Hiroshima Prefecture-sponsored scholarship, there were 15-16 applicants. 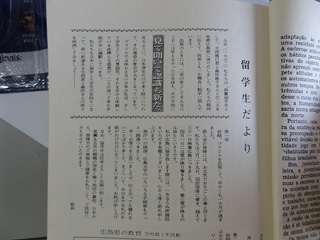 The scholarship was for children of immigrants from Hiroshima*. I was ranked number two, and together with the best, I could go to Hiroshima University for studying. (*) The Hiroshima Prefecture-sponsored scholarship was established in 1962 for children of immigrants from Hiroshima in Latin America. The period of study was one year. The scholarship became abolished in 2008 due to financial difficulties. From Brazil, 57 students came to Hiroshima University and other universities in Hiroshima Prefecture. － What kind of test was it ? We had to read and to write a report. － When was the test ? In October 1971. The students were to leave the following March and had to be elected before that time. － The Hiroshima Prefecture-sponsored scholarship was abolished. How about the scholarships of other prefectures ? There are still about ten prefectures providing such scholarships. Not long-term overseas study, but training periods of 8 months or maybe less. It was my first time to go abroad. It was a propeller aircraft and it took about 36 hours to fly to Japan. From São Paulo we went to Lima, Peru, Los Angeles and Honolulu. On March 29th, I arrived in Haneda. － You changed the plane for 3 or 4 times, didn’t you ? Yes, and in fact I stayed for 1 night in Honolulu. From Tokyo to Hiroshima I took the night train. It took me 11 hours. It was a sleeping car. － What was your first impression when you arrived in Haneda ? I was worried whether I could become acquainted with the environment here. Before then, I had lived together with my family and had no experience of living alone. － Did somebody see you off when you left São Paulo ? Almost all of the prefecture-sponsored international students had gathered to travel together. I don’t remember how many there were. Before departure, we had completed preparations at the Bunkyo*. There was an explanation meeting and easy language classes for those who didn’t know Japanese. A group of former prefecture-sponsored international students took care of us. In previous years, many of the students had gone to Japan by ship. When we heard about that, some of us said, that they would prefer to take the ship (laugh). Sailing around the southern tip of Africa, the journey was as long as 50 days. We were told that even with by-passing the Panama Canal it was about 40 days. Back then, there were ships such as “Argentina Maru”, “Brazil Maru” or “Sakura Maru”. These were half passenger half cargo ships and it took almost two months. Compared with this, the airplane was really fast. But when we were flying over the Andes, the plane was shaken by turbulence and our meals flew all over the place (laugh). (*) Bunkyo; Abbreviation for Brazilian Society of Japanese Culture and Social Services (Sociedade Brasileira de Cultura Japonesa e de Assistência Social). It is a central association of the Japanese immigrant community in Brazil, uniting local organizations and cultural institutions. The goal of this institution is to enhance the immigrants’ living and cultural standard, to enlighten the public and to propel art such as flower arrangement, music and other cultural activities. Bunkyo also supports children of immigrants providing scholarships and has an own library for educational work. Together with Beneficência Nipo-Brasileira de São Paulo (abbreviated to “Enkyo”) and Federação das Associações de Províncias do Japão no Brasil (abbreviated to “Kenren”), Bunkyo is one of the three main organizations of Japanese immigrants in Brazil. When I arrived in Tokyo I said goodbye to my friends. Staff from Hiroshima Prefecture picked me up and we went together by night train to Hiroshima. － According to the records, you arrived in Hiroshima on March 31 and it was snowing on April 1. Is that correct ? We had never seen snow before. People at the dormitory said that it had snowed often that year. That day, it was snowing only a little bit, and there was no snow on the streets in downtown Hiroshima. － After arriving in Hiroshima, did you visit the prefectural office ? I went together with the other international students from Peru. I was surprised that we could meet the governor. That motivated me to study even harder. This year (1972) we dispatched Mr. Hiromu Onishi and Ms. M. as prefectural sponsored international students to their ancestral homeland Hiroshima. Both of them are responding to our expectations by studying very hard. Typical for the second generation, they almost didn’t know any Japanese at the time of their departure, but their following letters showed that their improvement will continue the longer they are staying in Japan. We were happy to read about their experiences of their Japanese lifestyle, things impossible to enjoy in Brazil and their descriptions of student life and direct personal impressions. Let’s read the letters of these two young fellows who went to Japan for study and feel with their hearts. * Ms. M. is indicated by initials. （Left） The above mentioned magazine “Geibi” published letters from Mr. Onishi written when he was studying in Japan, in the section headed “Letters from the International Students”. － How was your Japanese reading and writing ability ? Reading was difficult. Hearing was easier. I only understood about the half of the contents. The technical terms were the most difficult. － Were there no Japanese language classes at university ? There weren’t, but when you are interested and want to know something you have to do it by yourself. As there were about 90 students attending a certain lecture, the teacher can’t provide a detailed guidance to each of them. Sometimes, I went to the teacher after lesson and asked him/her to set aside 10 to 15 minutes to answer my questions. － What was the procedure for entrance ? 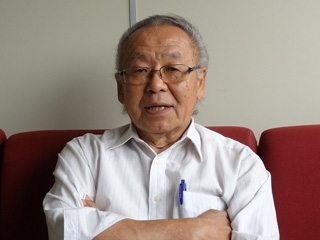 (*) Mr. Onishi told us that many of the second-generation Japanese-Brazilians played soccer when they were young, although their parents were against that. One of the most famous players of those days was Sergio Echigo, who is presently active as a popular soccer commentator. － Who was your supervisor ? First, my supervisor was Mr. Kanazawa. I often visited his office to listen to his explanations, but he suddenly fell ill. I was at a loss and decided to ask the prefectural government for the allowance to visit police related institutions and prisons. So, I had the opportunity to talk with many people. It was quite educational for me. － What kind of lectures did you take ? Kanazawa sensei helped me choose the lectures, of which I mainly chose specialized lessons. But the problem was that I couldn’t read the specialized books and documents and I had to wait for somebody to help me. I needed somebody to read it to me and provide an explanation. Later I could find a senior high school teacher who wanted to learn Spanish and we exchanged favors. Although he was quite busy, he often read books with me and gave me explanations and I taught him Portuguese in return. － There was no tutor system to support students ? － How many hours did you study per week ? I had lessons every day, mainly about law. For the rest of the time I attended other lectures, mostly about economics or accounting. － What did you do during your free time ? When we were free, the Brazilian students went together to Kyoto, Okinawa and other places. There were many international students from Brazil in Japan. Students living in Ehime used to visit Hiroshima about twice a month and students from Okayama or Tottori came to Hiroshima quite often. （*）In 1972, the number of international students enrolled at Hiroshima University was 39. Among them, 20 students were from Taiwan and 4 each from Brazil and Korea and 2 each from Peru, Indonesia, and Sri Lanka. － Did you engage with international students other than children of Japanese immigrants ? For most of the time I was together with students from Latin America. There were Argentineans and students from Peru. We often talked together, but they didn’t understand Portuguese, so I had to speak Spanish. My Spanish improved a lot (laugh). － How about your Japanese friends ? With my Japanese friends I spoke in Japanese. Some time ago, one of them visited me in São Paulo. He saw an article about me in the Chugoku Shimbun newspaper and asked the prefectural office for my address. Because he said he planned to go to São Paulo next month. － How did you spend time with your friends ? － What did you do on weekends ? I studied of course. Sometimes, I didn’t study on Sundays but always on Saturdays. I also had homework to do. I felt a little bit insecure. Do you remember culture differences between Japan and Brazil ? Yes, for example vending machines. They are everywhere, aren’t they? I was worried that thieves would come (laugh). It was impressive for me to see that and I thought that Japan was great, and that it is because of their childhood education. I felt that children have to learn things at the age of 4-12, or all will be in vain. And I wished to introduce this kind of education to Brazil. There is one more interesting experience. After my stay as an international student, I came back to Japan for a visit with an official from the Brazilian government to meet a person from Keidanren (Japanese Business Federation). He liked smoking, and at time it was allowed to smoke everywhere. Nowadays it’s limited. The Brazilian noticed that the Japanese was hiding his cigarette with his hand when he was smoking. I once again noted that the culture of Japan was very refined and different. － Japan has a culture of concern, doesn’t it? Can you tell us your funniest story ? Yes, I can remember this one time quite clearly. It was my second day in Hiroshima, I think. I went to a restaurant close to the station. The menu was written only in Japanese. I couldn’t read it and I selected by solely looking at the price. The waitress asked me “This one?” and I said “Yes.” Then she brought me a dish with rice shaped to a slight dome with a flag on the top and a whistle near to the plate. I had ordered the kids’ lunch set by mistake (laugh). I couldn’t help but eat it in a single bite (laugh). After that I always ordered looking at the numbers. － Where did you live in Hiroshima ? When I was studying in Hiroshima, I was living at the Hiroshima Asia Bunka Kaikan (Hiroshima ABK), which was very convenient. International students sponsored by other prefectures had the option to rent rooms or to stay with a host family. Public transport was also challenging. In the beginning I didn’t know which bus I should take for the university. In Japan, on the bus was written “one-man bus”. I didn’t know the meaning. I thought that it was the name of the direction. Later, I was able to understand that (laugh). Finally, I decided to commute by tram. － Where was the Hiroshima Asia Bunka Kaikan located ? It was on the hillside of Futabayama, north of Hiroshima Station. Going to school was easy, because it was downhill. But it was very hard to return home, especially in the summertime, as the hill was so steep (laugh). Even taxis avoided the area. － How was the dormitory ? It was for international students. Mrs. Mitsuko Sanui focused her support on international students from Asia and was promoting that. She called on all parties and succeeded in establishing the Hiroshima Asia Bunka Kaikan, a branch of ABK Asia Bunka Kaikan, Tokyo, and she became the first director of this institution. (*) The first director of Hiroshima Asia Bunka Kaikan (Hiroshima ABK) Mitsuko Sanui, who was the wife of the Hiroshima University professor Tetsuo Sanui, wished to carry out her husband’s will and appealed to the local business leaders to establish the Hiroshima Asia Bunka Kaikan as a branch of the Asian Students Cultural Association (Tokyo). In 1969, a steel reinforced concrete four-story building was erected. It was used as a rooming house for international students for a period of 32 years until it became closed in March 2001, due to ageing. In the same year, the Hiroshima City International House was opened and took over the functions of the Hiroshima ABK. － How was your life there ? In the dormitory, you have to clean and wash by yourself, don’t you? In the beginning, I was not used to that. They told me that I should stomp on my T-shirt while taking a shower so it would get clean (laugh). Looking back, I think that it was very good that I had to do things by myself when I was young. It took me about half a year to get used to it though. When I had time, I went home early and helped the dormitory staff with cooking etc. Most people watch TV and take no notice of others. My father was always ordering me about. When I was reluctant he said “Be helpful!”. The people working at the dining hall were very busy and there was only a few staff. With my father in mind, I thought that it must be hard and started to help them. We became friends and I could learn a lot from them. Whatever I asked, they gave me an answer. The experience was really uplifting. － What did you do after you finished studying at Hiroshima University ? During my study in Hiroshima, I took a lot of photos. When you order a “Speed Photo”, your film will be developed within 1 hour. I knew quite a lot about photography and thought that it would be a good idea to have that system in Brazil. At the time, photo developments in Brazil took 3-4 days. （*）The Association for Overseas Technical Scholarship（AOTS）is an organization with the purpose of accepting and educating industrial technology trainees from foreign countries. It was established in 1959. AOTS formed a merger with the Japan Overseas Development Corporation (JODC) in 2012 and was renamed Overseas Human Resources and Industry Development Association (HIDA). － Did you apply for the AOTS training program during your study at Hiroshima University ? The application procedure had to be done not by the company but by the applicant himself/herself. I went to the prefectural office for consultation. I was told that I had to go back to Brazil after my 1 year of overseas study. But in case of further education as a trainee, they advised me to directly seek approval from the Hiroshima-Kenjin Kai and other related persons. So I wrote a letter to the president of the association and obtained the permission. － What kind of training was it ? I was in the lab as trainee for 1 year. The lab even wanted to pay me. In the beginning I said that this was impossible, but after some time I was paid an allowance, which helped me a lot. I used it for going out to eat and other leisure activities. The laboratory chief said that newly recruited employees are normally useless in their first year, but he mentioned that my performance was at 70% and he was more than happy about that. Before I returned to Brazil I told him that I would like to take a machine home with me, but the vice president of F. in Tokyo said that it would be better if I didn’t. Investigations held before establishing a lab in Brazil found that the numbers of films developed within 1 year was even less than in Japan on the weekends. It proved to be a very small market. He told me he wanted me to work at his lab instead, but it was too far away and difficult to commute. F. Company built a lab in São Paulo, which recently opened when I went back to Brazil. As I had some experiences in this field, I could help to dispatch two Brazilian trainees through AOTS from their Brazilian office to Japan. － Did you still live at ABK during your training at AOTS ? － What did you do after returning to Brazil ? When I returned to Brazil, I applied to take an employment test to become a police officer. I applied in 1974, immediately after my return. The exam was in 1975. But I was never summoned for the test because of a legal amendment after the date of my application: future police officials had to be taller than 167cm. One of my colleagues appealed to the court and could obtain the right to work, but I didn’t bother. － What did you do then ? I was already employed at M. Company, which had expanded its business into Brazil and it was planned to dispatch more than 40 Japanese employees to Brazil. When I was an international student at Hiroshima University, I taught Portuguese after my lessons at university. So, after university, I went directly to Otake City to teach Portuguese because the employees, who were going to be dispatched for Brazil were gathered there. I taught them standard Portuguese conversational and spoken language for about 6 months. After my return to Brazil, they contacted me and asked me to work with them. I worked at M. in Brazil, for 26 years and I managed to hold a good position. My entry position was an executive assistant. － Why did M. Company expand to Brazil ? M. bought a vast area of land in Brazil and planned to build five factories 70km from São Paulo. The construction started in 1974. － What kind of work was it ? As I understood both Japanese and Brazilian corporate culture, I assisted executives from Japan because M. Company had an office in São Paulo. Later, I worked as a president’s assistant, my main responsibility lied with general affairs. I was in charge of dispatched employees and representatives stationed in Brazil. Furthermore, I was the contact person for suggestions of improvement, praise and/or criticism within the company. There were also matters concerning Brazilian law. As I worked in a company like this after my return to Brazil, I often went to the Chamber of Commerce and Industry and similar places. A term of presidency was about four years, then they changed. － Was it helpful that you had been an international student of Hiroshima University ? Yes it was. When the first president went home to Japan, he said to me at the airport that he was very happy and lucky to have had a person like me who knows both Japanese and Brazilian cultures. He could do his work without worrying about anything. From that moment, I felt that overseas study was helpful not only for me, but also for a foreign-orientated company like this. － You haven’t worked at F. Company ? I had also an offer from M., and the office of M. was in downtown. F. Company was technically orientated, but I wished to use my knowledge on personnel and labor affairs - things I learned at university. I benefitted a lot from my study at Hiroshima University. The president was right when he said that I was helpful. This system of foreign study was very good. － Until when were you employed ? I had been there for 26 years, up until 1996. We made investigations on air-conditioning equipment. We believed that the market for air-conditioning would grow in the near future. But there was nobody who could undertake that work so they asked me to work as an agency of M.
What can you say reflecting on your life as an international student at Hiroshima University ? There were positive and negative aspects in Japan and I also experienced some failures. Studying Japanese law was the most useful thing I did. Then, Japanese enterprises were expanding to Brazil, and it was very helpful to know both law systems. For example, there are things allowed by the Japanese labor law and forbidden by the Brazilian law. I extremely benefitted from knowing both. Some time ago, I watched a news report about Brazilians who were sent abroad as part of the “Science Without Borders” project. * However, they don’t study and just have fun. As they have the rare opportunity to be dispatched to foreign countries, they should inspect and study as much as possible. They don’t realize the benefits of that. After witnessing that, I repeatedly told students going abroad that they should discover a lot of new things, see as much as possible and that it is to their own advantage. (*) “Science Without Borders” is a dispatch program funded by the Brazilian government for sending students and researchers abroad. This project started with the purpose of promoting academic exchange of students and researchers in Brazil against the background of progressing internationalization of the Brazilian universities. The project plans to send about 100,000 Brazilian scholarship students to foreign countries before 2015, particularly in the fields of science, medicine and agriculture. What do you think was the significance of the Prefecture-Sponsored International Student Program ? Regarding this program, improvements needed to be made on both sides. We tell young people they should learn Japanese because there is a program for them and that it will be useful for their future. But they don’t do it. One reason for that is that they have no time. There are also Japanese language schools in São Paulo, but most lessons are only once or twice a week, each for about 1 hour – not enough to actively retain and learn a second language. Japanese should be studied every day. It is meaningless to go to Japan without understanding anything. Nowadays, some people say that English would be enough, but I believe that it is better to be able to understand Japanese as you can read books or watch the news. I think that would make overseas study more meaningful. Also Japan is facing economic difficulties; the working population is diminishing and many enterprises outsource to Asian countries, perhaps they will also come to Brazil. It would be good to have personnel who not only can speak Japanese, but who also knows Japanese customs etc. There are guest workers too, but they don’t know management or administration, and such people are also necessary. For example: There is a tendency in Brazil to bring everything to court. I think that it would help overseas operating companies a lot to have personnel specialized in law issues. Because of this, I believe we need more study abroad programs. There is also a program offered by JICA (Japan International Cooperation Agency)*, but I also want the prefectures to make efforts. Furthermore, a period of 3 months is too short. It takes at least one year to get used to the life in Japan. I always tell students that one year goes by very quickly and that you have to take the initiative and study a lot to be able to benefit from your year abroad. Don’t have a passive expectation. When you don’t study actively, it ends up in just having fun. What a waste! Of course, we need a program like this, but the students should be more conscious. I also wish that students are told that on the Japanese end too. That would be good for the students themselves and also for society in general. Japanese people dispatched to Brazil should keep their eyes open, too. I believe that it will be good for Japan in the future, and you never know when and where your knowledge will become useful. (*) JICA (Japan International Cooperation Agency): After war, overseas migration was propelled by the government. The overseas migration organizations established for this purpose developed into JICA, which turned into an independent administrative institution. Presently, JICA is chartered with assisting economic and social growth in developing countries and the promotion of international cooperation. But it also conducts support activities for Japanese immigrants and other people of Japanese provenance. Mr. Onishi experienced Japan as a student. He has gained a lot of knowledge and has been acting as a personality knowing both sides, that of Brazil and that of Japan. I was impressed to hear that his study year at Hiroshima University was not only important for him, but also for the mutual understanding of both countries. Recently exchange between the two countries is getting more and more active. Brazil has the biggest community of Japanese immigrants. Nevertheless, it must be noted that the present generation almost doesn’t speak Japanese anymore. In the future, new forms of exchange will have to be created. In that context, our interview with Mr. Onishi was very thought-provoking.